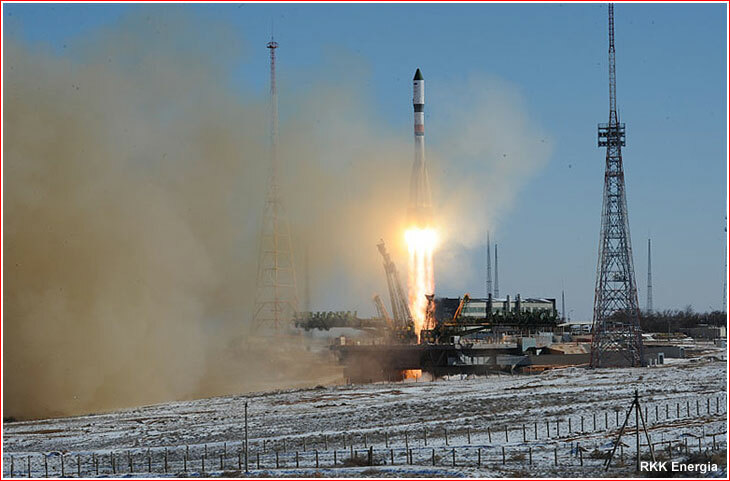 A fresh cargo ship rode a Soyuz-2-1a rocket for the first time on Oct. 29, 2014, marking a milestone in gradual adoption of modified launch vehicles for the human space flight. 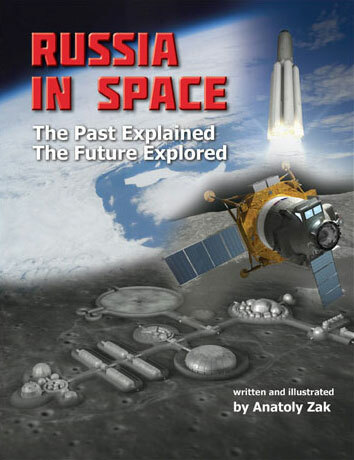 The launch and docking of the Russian Progress craft went without a hitch just hours after an Antares rocket powered by the Moon Race-era Soviet engines and carrying a Cygnus cargo ship bound to the ISS had exploded at launch over the Wallops Island off the cost of Virginia. Please help to keep this site open and current! The pace of our development depends primarily on the level of support from our readers. 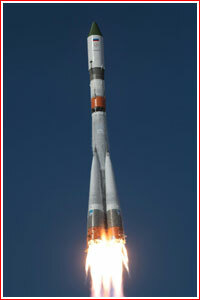 Progress M-25M delivered nearly three tons of fuel, food and other supplies to the International Space Station, ISS, in support of the 41st long-duration expedition on the outpost. In the ISS schedule, this cargo mission has designation 57P, denoting the 57th Progress vehicle dedicated to the program. 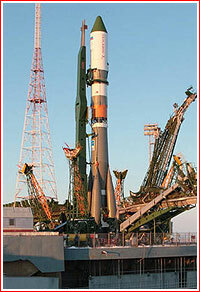 It would also be the 156th launch to the ISS since the beginning of its assembly in orbit in 1998. 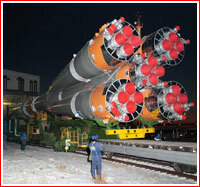 The rollout of the Soyuz-2-1a rocket with Progress M-25M from its assembly building to a launch pad at Site 31 in Baikonur started on October 27, 2014, at 04:30 Moscow Time. 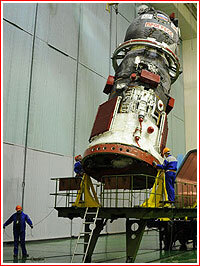 Above: The final assembly of Progress M-25M. Above: Rollout of the Soyuz rocket with Progress M-25M spacecraft on Oct. 27, 2014. 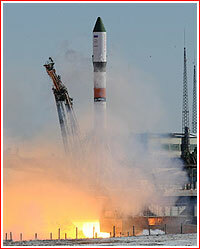 The launch of a Soyuz-2.1a rocket with the 7,290-kilogram Progress M-25M spacecraft took place as scheduled on Oct. 29, 2014, at 10:09:43 Moscow Time (3:09 a.m. EDT) from Baikonur Cosmodrome's Pad 6 at Site 31. 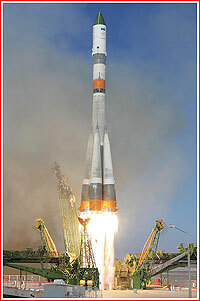 Following a vertical liftoff, the launch vehicle headed east to enter an orbit with an inclination 51.6 degrees toward the Equator. 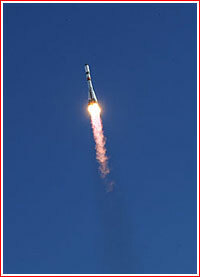 According to the Russian mission control in Korolev, four boosters of the first stage were jettisoned 117.48 seconds in flight and then impacted the ground 355 kilometers from the launch site. The core booster of the second stage fired for 276.89 seconds and separated after 287.17 seconds in flight, moments after the ignition of the third stage. 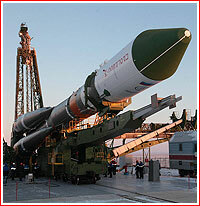 The second-stage booster then fell to Earth 1,550 kilometers downrange. In a departure from the traditional launch profile of Progress missions, a payload fairing covering Progress M-25M was jettisoned 136 seconds later than usual to coincide with the separation of the third stage. In the new timeline, it split into two halves and separated at T+296.35 seconds in flight. Less than half a second later, a tail section covering the engines on the third stage split into three segments and also separated. As a result, fragments of the payload fairing and the tail section could crash in the same impact site 1,576 kilometers from the launch site. 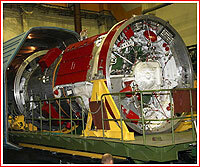 The third stage fired until T+524.87 seconds, when the cutoff command known as GK-3 was issued to its engine. 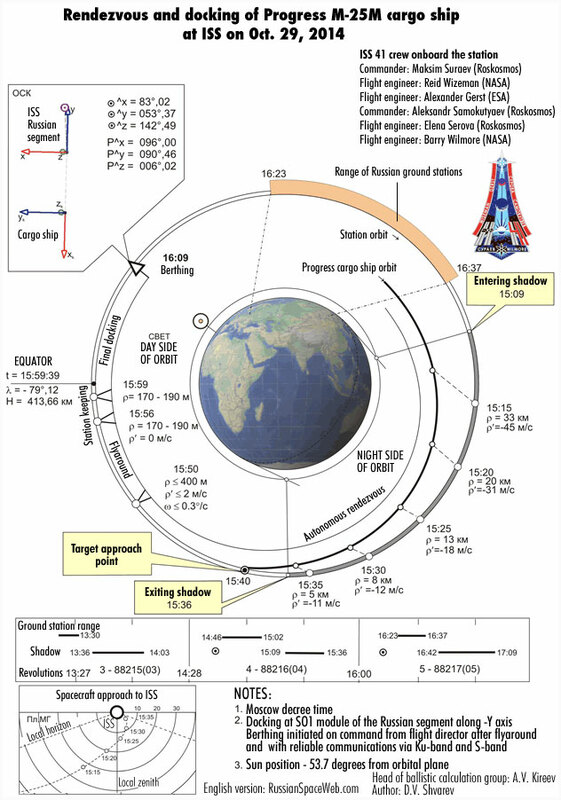 Four seconds later, at 10:18:30 Moscow Time (3:18 a.m. EDT), the Progress separated from the third stage into a 192.8 by 239.1-kilometer initial orbit, the mission control in Korolev confirmed. 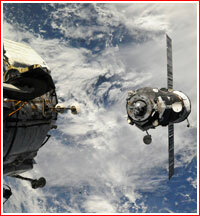 At that point, the ISS was orbiting far above in a 412.57 by 430.11-kilometer orbit. 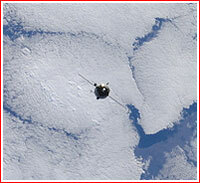 The autonomous rendezvous process began as scheduled at 14:03:17 Moscow Time (7:03 a.m. EDT) on October 29. 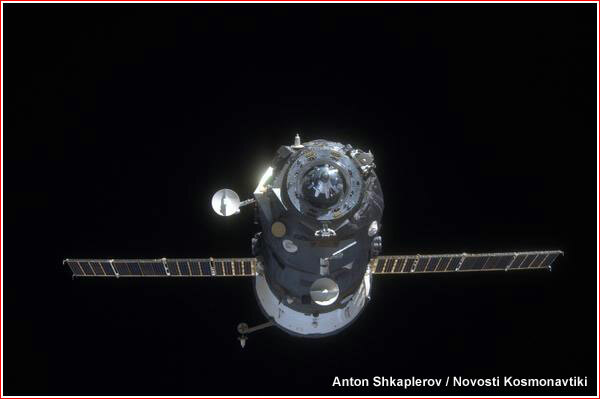 The final phase of the process including a flyaround of the station, a station keeping and berthing, was initiated also on time at 15:50:01 Moscow Time (8:50 a.m. EDT). 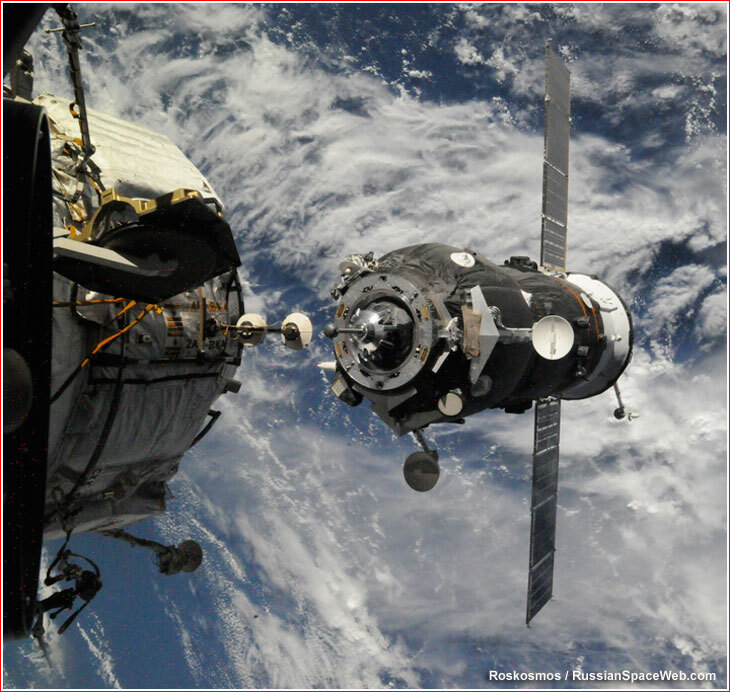 In preparation for the arrival of the fresh cargo ship, its predecessor -- Progress M-24M -- was undocked from the Pirs Docking Compartment, SO1, on the Russian segment of the ISS on Oct. 27, 2014. Above: Progress M-25M as seen from ISS during its rendezvous with the outpost on Oct. 29, 2014. In preparation for the launch of the Progress M-27M cargo ship, the Progress M-25M undocked from the ISS on April 25, 2015, at 09:41 Moscow Time. The spacecraft remained in the autonomous flight until April 26, 2015. 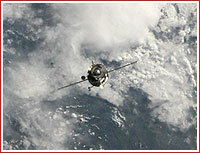 According to the mission control in Korolev, the deorbiting burn started at 15:08 Moscow Time and lasted 189 seconds. 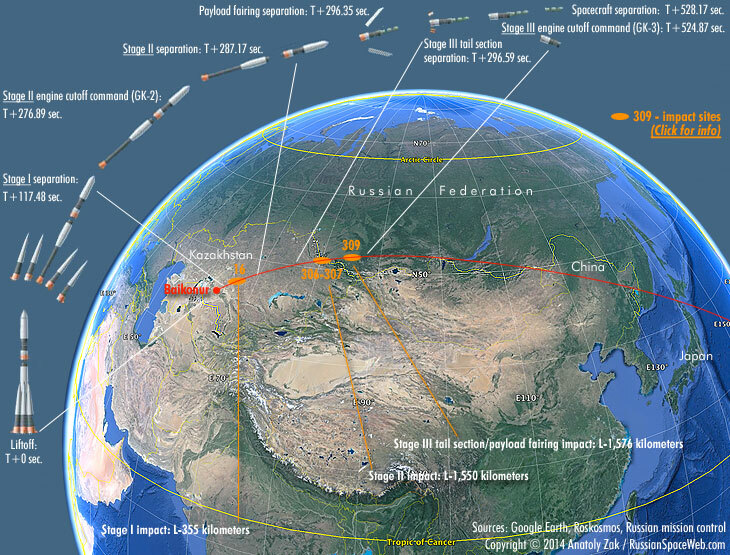 The maneuver slowed down the vehicle by 100.9 meters per second resulting in the reentry over the Pacific Ocean and the estimated impact of its any surviving debris at 15:57 Moscow Time.